The Vice-Chancellor, Prof. Olusola Oyewole (middle), signing the MoU, while the Regional Manager, Arewa Cotton, Mr. Bayo Olayemi (2nd Left) does same. With the Vice-Chancellor are the DVC (D), Prof. Felix Salako (2nd Right) and the Bursar, Mr. Moses Ilesanmi (Right). 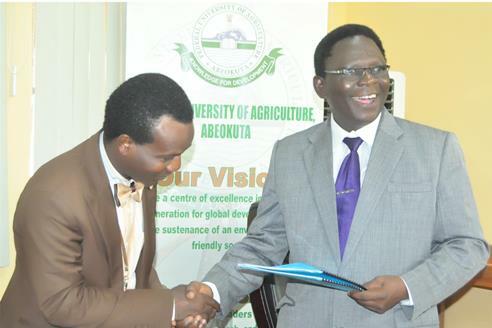 As a fall-out of the several meetings held in the past, to foster partnership between the University and Arewa Cotton and Allied Company Limited, the Management of the two institutions have signed a Memorandum of Understanding (MoU), heralding a formal collaboration in areas of research and cultivation of cotton in commercial scale in the Southwest states of Nigeria. 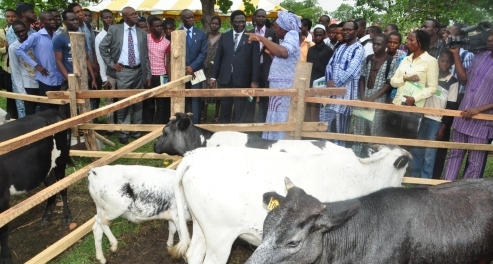 Speaking during the formal signing of documents, the Vice-Chancellor, Professor Olusola Oyewole, reiterated the importance of training young farmers in rural areas as the University’s Community-Based Farming Scheme had been of tremendous benefit to their host communities, the students and the University in this regard. The Vice-Chancellor added that the University would be willing to expand its scope of operations in the southwest states, if any intending host community could donate 50 Hectares of land for the implementation of the scheme. The Director of COBFAS, Professor Emmanuel Fakoya, said the collaboration was expected to stimulate cotton production in the country, adding that the staff of Arewa Cotton had earlier inspected Iwoye-Ketu with a view to cultivating cotton on a commercial scale. The Regional Manager of Arewa Cotton, Mr. Bayo Olayemi commended the University Management on the MoU, stating that in most developed countries, farmers were usually rich people but regretted that in nations like Nigeria, farmers were poor and hoped that his company would change the trend. “We are ready to ensure that our farmers are well equipped with the right knowledge and skills”, he stated. The Vice-Chancellor, Prof. Olusola Oyewole (Right), presenting copies of the MoU to the representative of Arewa Cotton, Mr. Bayo Olayemi. Olayemi lamented what he described as an undue stress in the course of interaction between his company and the Zaria-based Agricultural Research Company, as a result of the long distance between the two companies but expressed joy that with the latest collaboration with FUNAAB, Arewa Cotton will be better-off.